Why it’s daunting: Clever, confounding, and able to collaborate with everyone from Brian Eno to Neil Young, Devo has never been easy to parse. Yet the band’s music has never been less than accessible and catchy—even if, when it burst into the national consciousness with an iconoclastic 1978 Saturday Night Live appearance and the 1980 hit “Whip It,” America didn’t know quite what it was seeing. Forty-two years after the band formed in Ohio (and with the recent death of guitarist Bob Casale), perhaps America still doesn’t. Devo remains one of the most cryptic, subversive outfits—wearing some of the most cryptic, subversive outfits—to ever make millions of people dance and sing along—a paradox best experienced via the group’s infamous cover of The Rolling Stones’ “(I Can’t Get No) Satisfaction,” in which frontman Mark Mothersbaugh reduces one of pop culture’s most shopworn odes to horniness to a burst of staccato bleats—all while the band turns Keith Richards’ riff into a cubist puzzle. Possible gateway: Q: Are We Not Men? A: We Are Devo! Why: “(I Can’t Get No) Satisfaction” appears on Devo’s 1978 debut album, Q: Are We Not Men? A: We Are Devo!. Although the record doesn’t contain Devo’s signature anthem, “Whip It,” it’s the best first exposure to the band’s egghead prankishness, robotic perversion, and cool permutation of punk. Devo had been developing its sound long before punk exploded in earnest in 1976 and ’77, but that parallel development gave people an easy tag to hang on Are We Not Men?, in spite of the crisp Brian Eno production and the rigidly arch aesthetic of classic tracks like “Mongoloid,” “Jocko Homo,” and “Gut Feeling.” The album’s opening track, “Uncontrollable Urge,” sums up everything Devo was about at the time: garage-rock riffs pounded into jerky, angular spasms, all underpinned by lyrics that punctured the pop myth of America with icy, silly detachment. Devo’s performance of “Uncontrollable Urge” in the 1982 documentary Urgh! A Music War portrays the edgy tension at the heart of the song: Mothersbaugh stands as stiff as a deactivated android as he sings about his lack of control, quivering as if he were about to leap from his synthetic skin. Next steps: As founding Devo member Gerald Casale says in Simon Reynolds’ post-punk history Rip It Up And Start Again, “We wanted to make outer-space caveman music.” That mission remained in place on the group’s most successful album, 1980’s Freedom Of Choice—although Devo’s sound had, despite its devolutionary claims, evolved radically. While the songs are still jittery, sardonic, and weird, a sheen of synth-pop practically laminates the album. It’s a pivotal record in the development of new wave, but “Whip It” and “Girl U Want”—along with less-exposed tracks like the startlingly earnest plea for humanity “Gates Of Steel”—also showed Devo’s knack for carving crystalline pop out of performance-art provocation and perversity. Devo was seen by some as a novelty band, but 1981’s New Traditionalists ventured even deeper into pop territory. Beneath the slick, icy coating, though, lurked some of Devo’s darkest, angriest work. 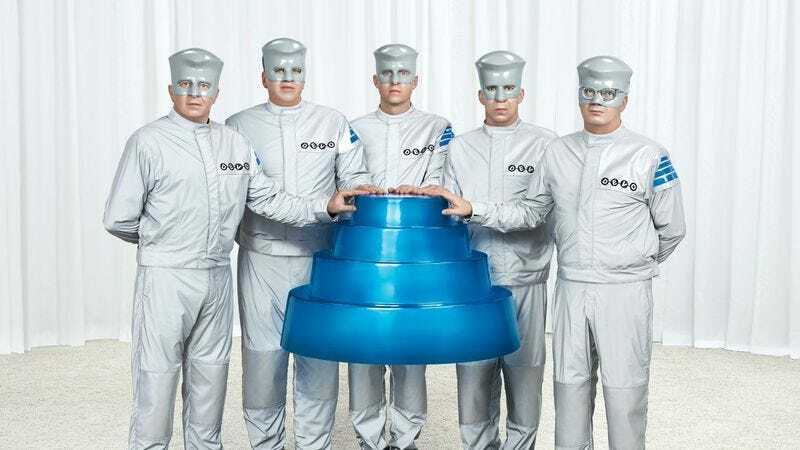 The Devo staple “Through Being Cool” may be a geek anthem, but it’s also universal enough that any stock character from teen movies can relate to it—the joke being that Devo wasn’t never trying to be cool in the first place. But on “Beautiful World,” Gerald Casale’s acidic contempt for hypocritical norms and the sloganeering glibness of the Reagan era bleeds from the song. The video remains one of the decade’s greatest time-capsule documents—and one of its greatest pieces of social critique designed for mass consumption. That surgical skewering of society—but always with a rigid grin—carries over onto Oh, No! It’s Devo, the final essential Devo album. Released in 1982, it came out the same year as Human Highway, Neil Young’s cult film that starred the members of Devo as garbage collectors in a dystopian version of America. In a strange way, that’s not too far from the truth. Devo’s unhinged version (performed with Young for the film) of Crazy Horse’s “Hey Hey, My My (Into The Black)” gathers up and unceremoniously dumps all the curdled idealism and rotted dreams of the time. And it carries resonance; Mothersbaugh and Gerald Casale were students at Kent State University during the tragic shooting of young protesters by the National Guard in 1970, an atrocity that Young immediately immortalized in the song “Ohio.” When the Oh, No! It’s Devo track “That’s Good” points out how “Everybody wants a good thing” and “Everybody’s looking for the same thing,” it feels more chilling than cheery. Where not to start: Hitting a sophomore slump in 1979, Devo made its second album, Duty Now For The Future, in a short-lived limbo between underground heroes and cultural touchstones. Accordingly, the album feels murky and unfocused, in spite of many stellar songs like “Smart Patrol/Mr. DNA.” But as a first glimpse of Devo’s twisted glory, it falls short. Still, it’s a solid album—and it’s far better than Devo’s sporadic output in the mid-’80s and beyond. Shout, Total Devo, Smooth Noodle Maps, and Something For Everybody—released between 1984 and 2010—are all worth hearing. 1990’s Smooth Noodle Maps in particular is a neglected album in the band’s catalog, one whose quirky “Post Post-Modern Man” sums up Devo as perfectly as anything.